As the US reels over the latest shooting at a high school campus in Parkland, Florida - the 18th so far in 2018 - "thoughts and prayers" from public figures are not all being well received on social media. When GOP chairwoman Ronna McDaniel tweeted that her heart was breaking for those affected, Ms Kalb's response that GOP candidates took more than $17m (£12m) from the NRA was retweeted more than 7,500 times and liked 11,000 times. The figures that Ms Kalb used are based on an article from the New York Times in October 2017 following the Las Vegas shooting. The paper produced a list of all the thoughts and prayers expressed by senators and the money they had received from the NRA during the year 2016-2017. In response to Florida's senator Marco Rubio's post that "Today is that terrible day you pray never comes" Ms Kalb wrote the figure $3.303,355. However, not everyone agreed with Ms Kalb. One response to her tweet was that the people donated to campaigns for politicians that vow to protect the second amendment. After Congressman Ken Buck wrote how devastated he felt about the shooting, Ms Kalb simply posted "$800,544 from the NRA." Several hashtags have emerged on Twitter, including #NRABloodMoney, #ParklandShooting and #Florida. Whilst Jimmy Kimmel has not linked to Ms Kalb's comments, he tweeted his own message of sympathy, demanding "our leaders do something to stop this tomorrow. How many have to suffer before we stop looking the other way?". Gun control always provokes heated debate across the media. 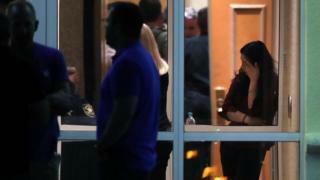 Radio host Wayne Dupree asked if news anchor Shephard Smith realised who was called to neutralise the shooter: "Men with guns, not pies, cakes and cookies".